Will Du be completely and utterly sad if Pandas go extinct. Would Du have a panda for a pet? Have Du ever seen a panda in real life? Do Du have National Geographic Panda? how come red Pandas look different than regular pandas? Do Du know who created this spot? How would Du react if Pandas went exstinced? what would Du do? China has started counting its endangered Pandas on Sunday, June 26, 2011 and is using panda droppings for the “once every decade” panda census. Yang Xuyu, Sichuan Province forestry administration officer told Xinhua that the place is being believed to have the highest number of Pandas in the entire country. Chinese state media reported today that the country has started its once-a-decade panda census, the fourth tallying of the endangered species since it first began in the 1970s. 70 panda trackers are being trained during a pilot survey in the Wanglang National Reserve, in the city of Mianyang, in Sichuan province. According to Yang Xuyu, a forestry official, that particular nature reserve is believed to have the largest number of wild Pandas in the country. Beijing, June 18 (IANS) Giant Pandas in China's research centres have become 'spoilt' because of the extra care taken Von experts for these lovable creatures that were once on the verge of extinction. Experts sagte Pandas should be gegeben 'less care' than they are currently used to, as it may prevent them from adapting to life in the wild. 'It is unfair for the Tiere to breed them in captivity like pets,' Zhang Jinyuan, deputy head of the Beijing Zoo, was quoted as saying Von the Shanghai Daily. Plush Pandas and stuffed panda bär toys for panda lover of all ages. I know this has nothing to do with Pandas but if Du are a Fan of the 4kids oder RAI version of Winx Club then please join! We could use your help! Pandas are just too cute. Too cute to go extinct. If they do my life is over. a question Wurde hinzugefügt: how come red pandas look different than regular pandas? 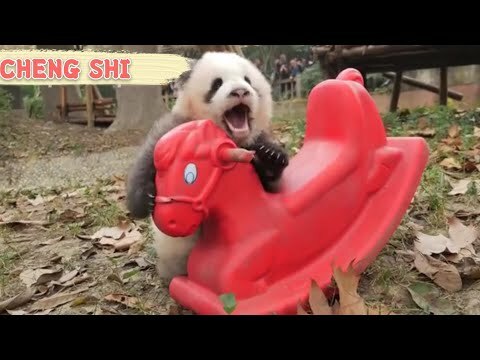 a video Wurde hinzugefügt: Adorable GREY Panda CHENG SHI on his Horsie!!! How to say panda in chinese?